Plans for a bikeway and pedestrian trail along Chollas Creek have pedaled forward as San Diego planners named Groundwork San Diego as manager of a $541,000 grant. The money will pay for trail design and environmental review of the mile-long path linking Southeastern San Diego neighborhoods to Bayshore and the 32nd Street trolley station. Funded jointly by the county of San Diego and SANDAG’s Active Transportation Grant program, the money will enable Groundwork San Diego to engage residents, businesses, and government stakeholders in the design of the trail route, which will combine dedicated paths and sections shared with local traffic. The bikeway is part of the city-approved Chollas Creek Enhancement Program, which aims to transform the natural resources of Chollas Creek into a fully functioning waterway connecting parks, trails and neighborhoods along its 12 linear miles. In addition to giving bicyclists and pedestrians a way to get to the area near 32nd Street and Harbor Drive, it will give them a chance to experience the natural environment along the creek. Meetings are being held with the Southeastern Planning Group, local schools, neighborhood organizations and interested residents and business owners along the route. A preferred route will be recommended after completion of preliminary traffic and environmental studies. 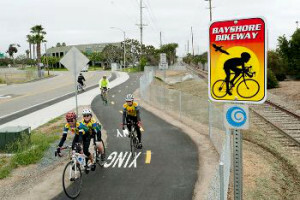 “Our team has been meeting with scores of residents, planning group members, property owners, and representatives from the Navy, the City, SANDAG, and Caltrans to figure out the safest, most efficient, and most enjoyable route for our residents in Mountain View, Southcrest, Shelltown and ultimately Encanto to walk or bike to the bayfront and trolley stop,” said Leslie Reynolds, Executive Director for Groundwork San Diego. The bikeway will run from Southcrest Trails Park on a dedicated path along the creek that goes under the Interstate 15 bridge to Rigel Street. From there it transitions to a bike lane shared with local traffic. The next section, along Main Street will include a dedicated lane for cyclists separated from traffic. The trail will then travel along a pristine section of Chollas Creek down to Norman Scott Street, and then to Harbor Drive. The proposed bikeway has been included in many plans throughout the years, from the Barrio Logan draft community plan to the 2002 Chollas Creek Enhancement Program. To inform area residents about the bikeway, Groundwork will host “Cycle Southcrest” from 9 a.m. to 1 p.m. Saturday, June 7. The free event will take place at Southcrest Recreation Center at 4149 Newton Ave, San Diego. Festivities will include announcements about the project, food and drink, bike education and giveaways, a bike rodeo and a supervised bike ride. For more information about the event, call (619) 543-0430.